Attorney General Eric Holder’s proposal to rein in mandatory minimum sentences for low-level drug offenders comes at a time when American attitudes toward marijuana use are the most lax they’ve ever been and Americans are highly skeptical of the value of enforcing marijuana laws. A March Pew Research Center survey on changing attitudes about marijuana found that nearly three-in-four Americans (72%) believed that efforts to enforce marijuana laws cost more than they are worth. And 60% said that the federal government should not enforce federal laws prohibiting the use of marijuana in states where it is legal. (Last fall, voters in two states – Colorado and Washington state – approved the purchase of small amounts of marijuana for recreational use). 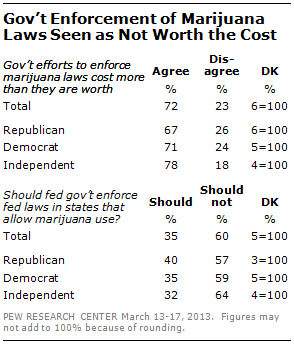 While there are partisan differences over legalizing marijuana use and on whether smoking marijuana is morally wrong, there is broad agreement across partisan and demographic groups that government enforcement of marijuana laws is not worth the cost. Fully 78% of independents, 71% of Democrats and 67% of Republicans say government enforcement efforts cost more than they are worth. Older Americans are less likely than younger age groups to say government enforcement efforts are too costly: 63% of those over age 65 say this, compared with 72% of those aged 50-64, 73% of those aged 30-49 and 76% of 18- to 29-year-olds. Public attitudes towards marijuana use have softened over the past few decades. Today, 38% of Americans view marijuana as a “gateway drug,” down from 60% recorded in a 1977 Gallup poll. However, older Americans are much more likely to say marijuana use leads to harder drugs: 56% of those ages 65+ say this, compared with only about a third of those in younger age groups.